Somewhere in the dense and balmy southern peninsula of the Commonwealth of Virginia, nestled amongst the vestiges of colonial history, lies an enclave of noise deviance, who counts, among its nefarious members, the twisted genius that is Feralcatscan. Whithersoexotica employs an array of Feralcatscan’s trademark sounds, derived from a treasure trove of homemade electroacoustic accoutrement and reverse-engineered electronic esoterica. The result is a deadly set of deep, long and extravagant atonal drones, adorned with tasteful touches of clanging metal. 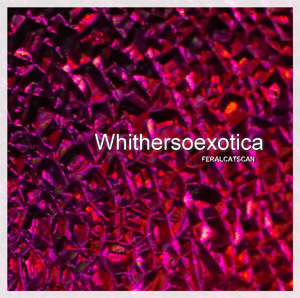 While new Feralcatscan releases are few and far between, Whithersoexotica is all the proof one needs that they are well worth the wait. Seven years later and I’m still listening to Whithersoexotica. “Luababapapaga” is the highlight for me with its warped rhythms. This album has a simply otherworldy atmosphere to it. Next Next post: Drop Box!